Other Opportunities for Writing and Awaiting the Issue Release. This month, November, is known also as National Novel Writing Month, or NaNoWriMo. Starting from November 1st and concluding on November 31st, writers around the world write a novel–50,000 words, on anything they want. Some writers are doing this solo, and others are working in groups based on regional location. I have done NaNoWriMo two years in a row myself, mostly alone, and this year I have decided to take a break. Accomplishing this amount of writing involves shutting off one’s “inner editor,” focusing on pounding out and fleshing out writing, and devotion to keeping up with your word count. NaNoWriMo has been running for 10 years, and authors have even gotten their NaNo (as it’s called) projects published! Essentially, it’s like most other writing projects. If you want to step up to the challenge, read the guidelines and tips on NaNoWriMo and cut in as soon as you’re ready–though the longer you wait, the harder it may be to keep up! Good luck, writers! Recently, as our submissions period has ended, we here at Superstition Review have begun upping the ante to focus on content pages and getting information and interviews from our contributing writers and authors. For me, as a web designer, this means I have begun to scramble frantically to meet our publishing deadline, and worry about content shortages as well as time shortages. We look forward to our release, nonetheless, and hope you’ll keep reading and be there to see our second issue! While Spring Break is right around the corner for everyone at ASU, the Superstition Review staff is still hard at work reading submissions and perfecting our site content. During March 17-21, all of the editors and staff of Superstition Review will be meeting with the express purpose of making our website more engaging and audience-friendly. We want our site to be a reflection of the wonderful art and writing that we publish, which means that it needs to be just as creative as it is professional. If you’ve viewed our current site and feel that you have some helpful ideas that would make our site more appealing to you as a reader or writer of Superstition Review, please feel free to e-mail us with your ideas so that we can take them into consideration during our site renovation. 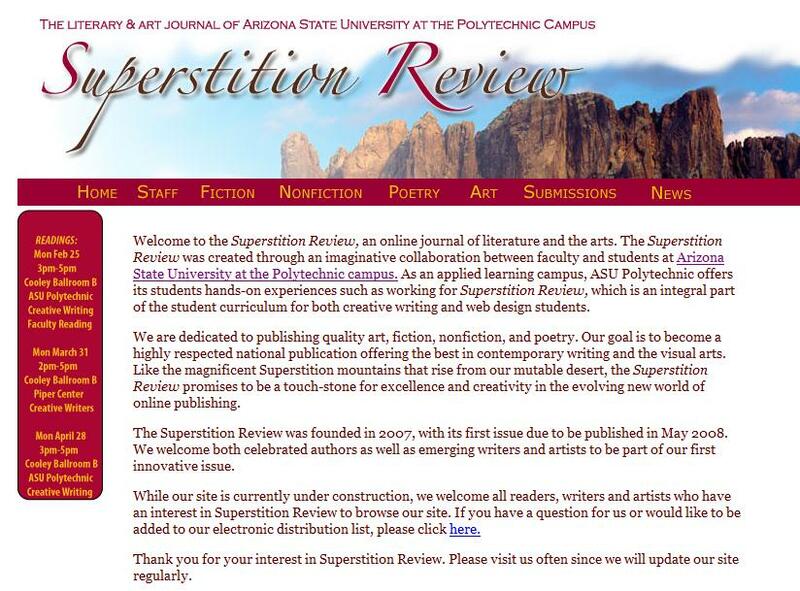 As always, check the News Blog frequently for updates about the magazine, submissions, upcoming events, or authors involved with Superstition Review.